The DSAM Convention 2011 with the theme ‘Direct Selling… Beyond Malaysia’ was held at the Grand Dorsett Subang, Subang Jaya, Selangor on 7th April 2011. This event, which was endorsed by the Ministry of Domestic Trade, Co-operatives and Consumerism (MDTCC), was participated by more than 400 delegates comprising of DSAM Member companies and non-members. The theme for this year’s Convention was in-line with MDTCC’s call for Malaysian companies to venture abroad plus to cater for the continuous growth of direct selling companies in Malaysia especially DSAM Members. The Convention was officially launched by MDTCC’s Minister, YB Datuk Seri Ismail Sabri Yaakob, accompanied by Y Bhg Dato’ Mohd Zain Bin Mohd Dom, Secretary General of MDTCC. In addition to the Minister’s keynote address, MDTCC also presented the ‘Malaysian Direct Selling Industry Updates’. This was followed by a presentation on ‘World Direct Selling Updates’ by the World Federation of Direct Selling Associations (WFDSA). companies venturing abroad. Lastly, in order for these Malaysian companies to successfully establish themselves overseas, Brand Alliance of Singapore presented the many ways for direct selling companies to brand themselves in a session entitled ‘Branding your Company for Global Success’. For the benefit of participating companies at the Convention, a small exhibition was held at the foyer of the convention hall featuring suppliers and vendors that are specific to the direct selling industry. Exhibitors from Malaysia, Singapore and the United States offered services ranging from IT Solutions, Product Manufacturers, Logistics , Education and Financial Transactions. Director of MDTCC, Pn Hathija Bebe Abdul Majeed. Among other guest present include DSAM’s Code Administrator, Tan Sri Sulaiman Mahbob, Executive Director of WFDSA, Ms Tamuna Gabilaia and the representatives form 10 Asia Pacific Direct Selling Associations. The evening started off with a welcome note from DSAM’s Vice President, Mr Frederick Ng. Throughout the evening, there were musical entertainment and lucky draws. Ten DSAM Member companies were also presented with the Membership Awards ranging from 10 to 30 years with DSAM. The recipients for 10 years of Membership were Lingua Publication Sdn Bhd, Neways Worldwide Sdn Bhd, Gano Excel Enterprise Sdn Bhd, Mary Kay (Malaysia) Sdn Bhd, OSN Network Sdn Bhd, Tahitian Noni International (M) Sdn Bhd, Total Reach Marketing Sdn Bhd, Healthy Homes Marketing (M) Sdn Bhd and VIVA Life Science Sdn Bhd. Grolier (Malaysia) Sdn Bhd received the recognition for 30 years of membership. The event closed with a roaring finale from Australian entertainer, Donna Daniels. 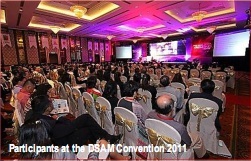 DSAM would like to thank ALL members for their support for the Convention and Gala Dinner 2011, especially those that have generously contributed to the Lucky Draw prizes and Goody Bags.